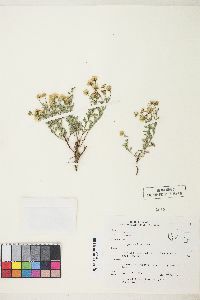 Perennials, 5-25 cm; taprooted, woody [usually not collected]. Stems decumbent-ascending to ascending-erect (caudexlike at bases), white-villous (hairs stiff), minutely glandular. Leaves cauline; blades narrowly obovate, 7-16 × 1-3.5 mm, margins entire, faces white-villous (hairs stiff), minutely glandular. Heads (discoid) 1 or 2-4 in loosely corymbiform arrays. Involucres (3.5-)4-5 × 7-12 mm. 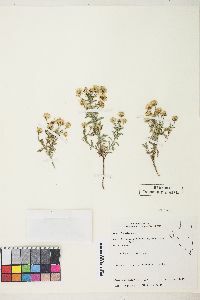 Phyllaries in 3-5 series, glabrous, densely minutely glandular. Ray florets 0. Disc florets corollas 3.2-4.5 mm (throats slightly indurate, not inflated). Cypselae 2-2.5 mm, 2-nerved, faces sparsely strigose; pappi: outer of setae, inner of 18-25(-28) bristles. 2n = 18. 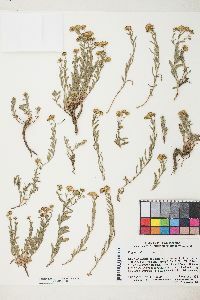 Flowering Jul-Oct. Taluses, rock crevices, montane coniferous forests; of conservation concern; 1800-2600 m; Calif. Erigeron miser differs from E. petrophilus primarily by its smaller heads; there also are overlapping differences in leaf size, disc corolla length, shape of the style appendages, and numbers of pappus bristles.